4. expectation of future performance of companies in the index. Just trying to get sense for whether micro or macro factors are primarily at play. Thanks! 5. First and foremost. Pick any country, compare it with the U.S. and you'll see some stark differences in the environment, both corporate and national governance. 6. High unemployment, poor demographics, high taxes. I own international, but I really have a hard time seeing the spark that will get the momentum going there. Apples and oranges. Comparing a small cap emerging markets fund to a domestic, mainly large cap fund? Come on now, you've been on the forum long enough to know better. The OP is likely inquiring about Total International. How about this one? Apples to apples enough for you? If OP doesn’t like the performance of Total International, maybe he shouldn’t invest in Total International. But to refer to “international underperformance” as a given Fact is head scratching. My international funds are doing great. Last edited by HEDGEFUNDIE on Sat Dec 08, 2018 7:13 pm, edited 1 time in total. Maybe this one, going back to 1994? This. International actually had little explanatory power. Sector and leverage has higher explanatory power. The US market hadbeeb blessed with the FANG companies. Every one of your points is part of under performance of international equities. The US is roughly 50% of the market cap of the world markets. Investors will have to earn a premium to keep investing in international. The market will eventually correct and provide that premium. 1. UK looks to be a disaster for decades because of Brexit. 2. Continental Europe: see above for cascading effects. 3. Japan: I’d love to hear an argument for future optimism. That’s nearly 60% of ex-US. To paraphrase Dirty Harry re:Europe + Japan: Do you feel lucky? None of which is exactly a secret ... Why do you assume these concerns aren't factored in to the current market prices? It can't all be the FAANGs. Don't let the chart scaling fool you, returns for international stocks were so much less than US that the US chart goes to $10,000 and the World ex-US chart only goes to $1,000. If you don't like this date range, which is close to "all available data," then state the date range you think should be used, and state some objective reason for using it--other than "gives the results I expect." I don't like this date range, either, but I have no idea what to do about it. Would you feel the same if your timeline was 20 years? Yes, but I don't think that's the story. I think rather it's flows. The story since 2008 has been investors chasing growth. The US took firmer and earlier monetary steps to start recovery sooner and combined with a strengthening USD (itself related to the business cycle) attracted US investment. Also, tax cuts and stock buybacks (sometimes funded by debt) fueled the process. Growth has done very well in a low rate environment, and we can see the taste for growth in the boom of US PE ratios. In any case, International vs US returns (from about the '70s) are about equal until 2008. Ferri has an article about it as do others. Since then though the US has really been on a tear. Q: If you expect the US to keep outperforming, why not go 100% growth stocks. After all, they are the better companies in the US. Why hold the inferior countries in the US and why hold the inferior companies in the world. A: Because value has its day too. Typically when growth gets overpriced and the business cycle changes. So I fully conceded that International stocks are perhaps rubbish as suggested. At the same time, I believe in the merit of value and valuations (but not in trying to time them). The US took firmer and earlier monetary steps to start recovery sooner and combined with a strengthening USD (itself related to the business cycle) attracted US investment. Also, tax cuts and stock buybacks (sometimes funded by debt) fueled the process. I think this is one of the strongest arguments for a US slant in equities over the next few decades but it relies on the assumption we'll do it again next time. I think we probably will. Global investors could well be assuming the US treasury has a few more batters up before the game is finally over which is priced into the market. Jack Bogle, Warren Buffett and all the rest know it but are probably smart enough not to say it in public. I think there are some good LC's internationally but who knows what their exchange rates are. The casino effect. Most internationals are smaller economies dependent on exports for extra profits. Not a monetarists' ideal situation, but good suppliers nonetheless. Foreign markets are segmented. Their is no global currency. Each economic group prospers according to it's internal position related to outside investor's concerns and how they can prosper investment wise. The ratio their currency is valued doesn't really affect their internal investor's value. Not to say the ingredients for Intl growth in global investor's portfolio's will never exist if it does currency risk will still remain. Currency losses on one continent will offset currency gains on another continent and investment losses on one continent will offset production gains on another continent. The casino effect. An international index is not the S&P 500. The casino effect won't permit that. Ever go to a robo advisor and get global REIT, global small cap Value, global bonds, the worst thing on earth IMO. So yeah, I'm not the biggest fan of International long term investment due to market segmentation(s). Why do you assume that those factors are factored in? Remember, the EMH is just that: a hypothesis. And Eugene Fama, one of the biggest proponents of the EMH, said just this year in an interview published on YouTube that "We know that markets aren't efficient. That's just the model. The question is how efficient are they." If you can demonstrate that empirically with a high degree of precision, you'll probably get the Nobel prize. FWIW, a recent recipient of the Nobel prize in economics has serious doubts about how valid the EMH actually is. I think your list is pretty good, but monetary policy is related to factors 1, 2, and 5...and perhaps should be it's own bullet. Last edited by pdavi21 on Sat Dec 08, 2018 9:59 pm, edited 2 times in total. I am not a firm EMH proponent but it sure seems like the European markets for the most part a pricing in a fair amount of pessimism. Of course those concerns are factored it in to the degree they are known. Who would ignore them? That said, are investors all really piling into FAANG because they believe the fundamentals deserve it and the expected growth can really be counted on to materialize. Or is there a group of investors who are just piling in because they expect FAANG, as the most obvious growth candidates, to be going up and thinking they can ride it to somewhere high and take profits. And can anyone really know to what degree expected FAANG growth will really be achieved (or more generally how much US growth can be achieved)? So to me it seems like, of course, Fama would say the markets are inefficient. Shorter term investors will view valuations differently because of their time frame. I don't think this means that concerns about various stocks aren't factored in by investors, only that some are geared up to switch holdings when flows change. So are concerns about international stocks ignored such that we might expect continued US outperformance? I don't think so. Rather I think Fama's point is people will ignore fundamentals (cheap is usually viewed too pessimistically and growth too favorably), chase short term growth and rely on their ability to switch. So are markets a voting machine or weighing machine? It depends on the time frame doesn't it? The voting machine is less efficient in the short term and the weighing machine more efficient longer term. Right now I see people voting on the US but expect longer term that US valuations will weigh down US returns for some time. When that will start or how long it will last is unknown to me. Arriving at that conclusion requires misinterpreting him, dramatically and perhaps intentionally. The reason I am drawn to a heavy international weight is actually precisely because of this data. Basically we don't know the future. The US could continue to win by 2% for the next 117 years or some other country or combination of countries could do the same. And the world performance has been acceptable. Unfortunately its entirely possible that world equity performance could end up lower than last 117 years but there isn't really anyting that can be done about that. I'm referring to Richard Thaler, specifically in this interview. What I've said is no misrepresentation of anything he said in that interview. That's why we diversify. 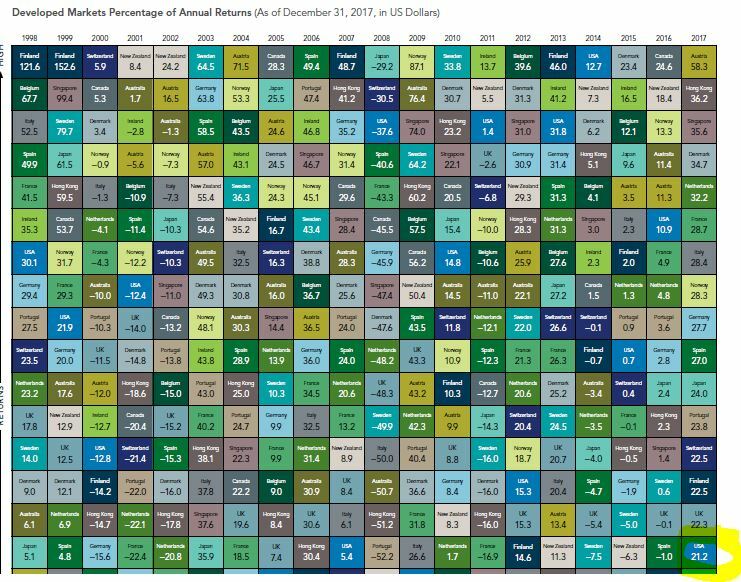 Only 1 year (2014) was it the best performer of developed markets only. If we include emerging markets, never once back to 1998 according to the charts above was the U.S. ever #1 in performance. I think you should at least start after WWII. America got a big production boost, while Europe and Japan were devastated. War is not exactly a black swan, but is it really likely to break out in Europe to that degree again? I don't know how relevant that past data should be for future predictions. I stand by what I wrote. If Thaler thought there were better models than the efficient market hypothesis, he’d say so. Does there have to be a model that describes reality all that well? I’m not making such an assumption. More than one out of every two dollars (to keep it simple) is sitting in US companies. The market is speaking clearly and loudly: it’s not particularly enamored with said places. So why aren't both dollars in the US? I never said that he thought that there were better models. He made it clear that he does not believe that markets are always efficient. It is entirely possible to call an existing model flawed without providing an alternative model. For interested onlookers, I'll include a couple of quotes of Thaler's that demonstrate the validity of what I said, that he has serious doubts about the validity of the EMH. He did say that it's a good working hypothesis for the average investor, but he also expresses dubiousness about it being universally valid. "If prices are too variable, they're in some sense wrong. It's hard to argue the price at the close of trading on Thursday, October 15th, and the price at the close of trading the following Monday, more than 25% lower, can both be rational measures of intrinsic value given the absence of news." Calling my assertion dramatic and perhaps intentional misrepresentation of Thaler in light of these and other statements by him is incredulous. I agree with you re: momentum; however, I currently view international as a solid value play. My allocation is 50% of equities. If you're invested in the U.S. market only and the healthcare sector was under performing for many years, would you try to eliminate that from your portfolio? Apparently not it seems. It's the same thing. The problem is, during periods of international outperformance, all those same factors applied and were known. It's the same for Japan and its issues - demographics, etc. At one point the same issues were seen as advantages, and then... not so much. Once you see the results, it's easy to come up with reasons that justify them. According to the World Economic Forum Global Competitiveness Report 2017–2018, America ties Switzerland at the top of those countries, which, inter alia, are the least corrupt. America has been at or very near the top from at least the early 2000s (as far back as I could find a few weeks ago from a quick search). We define competitiveness as the set of institutions, policies, and factors that determine the level of productivity of a country. The level of productivity, in turn, sets the level of prosperity that can be reached by an economy. The productivity level also determines the rates of return obtained by investments in an economy, which in turn are the fundamental drivers of its growth rates. In other words, a more competitive economy is one that is likely to grow faster over time. An efficient financial sector allocates the resources saved by a nation’s population, as well as those entering the economy from abroad, to the entrepreneurial or investment projects with the highest expected rates of return rather than to the politically connected. Business investment is critical to productivity. Therefore economies require sophisticated financial markets that can make capital available for private-sector investment from such sources as loans from a sound banking sector, well-regulated securities exchanges, venture capital, and other financial products. In order to fulfill all those functions, the banking sector needs to be trustworthy and transparent, and—as has been made so clear recently—financial markets need appropriate regulation to protect investors and other actors in the economy at large. I didn't make up the report. I don't have any connection to the WEF. The fact of the matter is that, on a spectrum of "pure as the driven snow" to "as corrupt as they come," the United States has a long history of being placed towards the first part of the spectrum. This may be an inconvenient truth, so to speak, to those who dismiss 100% US-only investors as being short-sighted, home-biased, emotional, Jack & Warren-worshipping know-nothings, but it's the truth nonetheless. And it's one of the reasons that I'm a US-only investor. If the US was ranked 137th, as is Yemen in the report, I'd be singing a different tune about 100%-US only investing. Indeed, if someone could show me that, as a matter of regular course, the US lags "these 50 countries" in financial-market development, I'd be happy to take a long, hard look. China’s Shanghai Composite is dominated by state-owned companies—the top ten valued companies are all state-owned. The Communist Party floats only a small percentage of a company’s equity on the stock exchange while keeping control of the rest. So a core part a company’s valuation—who decides corporate control, or a company theoretically being up for sale—isn’t factored into Chinese stock prices. Since 1992, when then president Deng Xiaoping praised stock markets, leading to China’s first boom, shares have been heavily influenced by government interventions. Last summer the state-owned press began publishing propaganda praising China’s undervalued stocks. Traders bought. That might be because Chinese stocks were never about free markets per se. The decision to open stock markets happened in 1990, following the Tiananmen Square massacre, followed by political infighting to determine whether China would continue follow capitalist reforms or turn back towards socialism. There were street markets popping up in Shenzhen where people started exchanging shares. “The markets weren’t needed for capital allocation. Big banks handled that for state owned sector,” Howie wrote. The Party sanctioned stock markets in response to these street markets—to control social unrest—and make the SOEs more competitive as it embraced capitalist reforms. Under President Xi Jinping, China's economic policy has shifted toward enhancing the organization and financial sources of state owned enterprises, and away from liberalizing the currency and financial sector. Strides that were made toward internationalizing the RMB and bringing about a more market-based financial system have been reversed. China’s growth rate is slowing, for sure, but the official statistics overstate real growth. Growth was at 6.9% in 2017, but this figure is meaningless if one takes into account the level of state control that makes it possible to achieve this growth. China incorporates industry value added into its GDP calculations, and at least half of these are state dominated, including the utilities, agriculture, telecommunications, social services, water conservancy, education, culture, and government agency sectors. This means that the government can choose a variety of industries in which to add value for the sake of boosting GDP. If China maintains its current policy trajectory of state control and slowing growth, it's likely to lose its true emerging market status. Sure, a growth rate of 3% is still slightly higher than that of the U.S. and other developed countries, and there are some industries, like e-commerce and high-tech manufacturing, that have attracted a lot of public and private investment, but it will be tricky for China to reach the heady levels of growth it experienced a couple decades ago. Unless reform is made a priority, China will lose its shine. Certainly this has happened to other BRICS nations, which were at one point darlings of the emerging market universe. As the essential emerging market characteristics slip away, investors look for more attractive destinations. How many hands of poker would you play with someone once you knew, or at least suspected that, they were cheating? If this is what no. 27 on the WEF report is doing, what's no. 52 doing? Number 34? I'm not interested in "diversification" when that means being the mark. Why would you do business with someone who's thumb is on the scale? As an investor with 20+ years of investing ahead of me (hopefully! ), I hope the US underperforms. I get to buy equities on the cheap for awhile. The reason why people say you should include alternative asset classes [such as international] is because CAPM theory, which is the intellectual underpining of modern portfolio theory and Boglehead principles, says you should. If international capital markets are open and asset prices conform to an international version of the CAPM, the market portfolio should include international assets. Fama and French (1998) find, however, that betas for a global stock market portfolio cannot explain the high average returns observed around the world on stocks with high book-to-market or high earnings- price ratios. The thread was locked before any answer to why this might be the case was discussed. Any ideas about this discrepancy? The important question to ask is, whether international should have same returns as US. When you put it in that context, it becomes clear the futility of these exchanges. Almost all international vs US thread starts with the premise that returns are expected to be same, and since they are not, then should we even own them. Why should we expect similar returns from dozens of non-related equity markets vs a single country equity in US. Perhaps comparison should be between individual countries, and not lumping all INTL as one block. Even such lumping as Europe, Pacific, and Emerging are arbitrary for purposes of marketing, packaging, and trading. These are all unique countries with their own accounting and security regulations. They also have different consumer markets, employment, inflation, lending practices, on and on that makes them all unique. Sure there are some common themes for instance with the EU and the Euro. But to lump Australia with Japan and measure them as Pacific vs US is absurd. Simiarly many Latin American countries are unique, Brazil is not same as Columbia, but we get to lump them all as Latin America and compared to US. We could keep going, but the problem is a basket of non related countries may never produce long term returns higher than a single developed country like US which accounts for half of the global equity market. That said, there was one period between 2003-2007 in the recent past where INTL as a while blew the US markets away, mainly fueled by Europe and the Euro advance against USD, before and after that US has outpaced INTL. All of this makes sense when you put that in that context. If we need to really break it down, then perhaps we should not be investing in US alone, but at same time perhaps not in the entire INTL and instead select the few countries we may need to diversify into. For instance, a reasonable goal for us could be to invest in the US market alone first, then once we have achieved that we could look at what are the other major markets outside of US to diversify into. Could we achieve same level of diversification by investing in UK, Germany, France, Japan, Australia, China, and Brazil, to name just a few. So perhaps instead of US, Developed Ex-US, Emerging, we should have a US, UK, Germany, France, Japan, Australia, China, and Brazil allocation. Aftet that if you are not satisfied, then perhaps add in a bit of Total Intl Markets. As long as it is a rule based system, such as select the 5-7 largest equity markets outside of US to further diversify and invest in individual ETF, this could work. Why not? what is wrong with this approach? It’s not terribly difficult to find actively managed, large cap funds, which - even after factoring in expenses - have tangibly outperformed VG Total International. You are more likely to lose money than make money by betting against the efficient market hypothesis. How does that happen if the market is "efficient"? Who would be getting the lost money? This is my first post on this wonderful forum. Found out this by chance from one article on MSN. To come to this question, can we imagine a world where US is doing terribly wrong and rest of the world is doing so wonderful that we complicate portfolio to include international exposure just for the hack of it. In my view three funds which have exposure to US should be good enough as a pure boglehead. No unwanted complication to chase few basis point in one or two specific year. I don't think anyone can definitively break down the % reason for past underperformance of international, though if I was to throw my 2 cents in I would guess the sector composition and rising dollar were a significant portion of it, just like the sector composition and a falling dollar were the last time international outperformed in the mid 2000s. All of the above you listed could also be reasons for US underperformance relative to international in the future, so seems like (to bring this to some actionable item) if you want to hedge against the possibility that the US will lag in the future it would be a good idea to own some international. Sure, since the 2008 crisis you underperformed if you held international, but a 50/50 portfolio (and even a 100% international portfolio) still had positive returns over that time frame: https://www.portfoliovisualizer.com/bac ... tion2_3=50. So it's not like international stocks have lost you money since then. Anyone who chooses to leave international out of their portfolio should just remind themselves that they won't add it back in if it has a 5-10 year run of outperformance. Just remember that international outperformed US stocks last year, and some of the EM value funds have been outperforming US stocks since January 2016, even with the 20%+ drop in EM this past year. Nothing worse than a bad case of FOMO. Last edited by asif408 on Mon Dec 10, 2018 2:29 pm, edited 1 time in total. Presumably, brokers getting commissions and trading fees and managers charging high ERs. Of course I can imagine such a world, although it seems as though many forum members cannot. 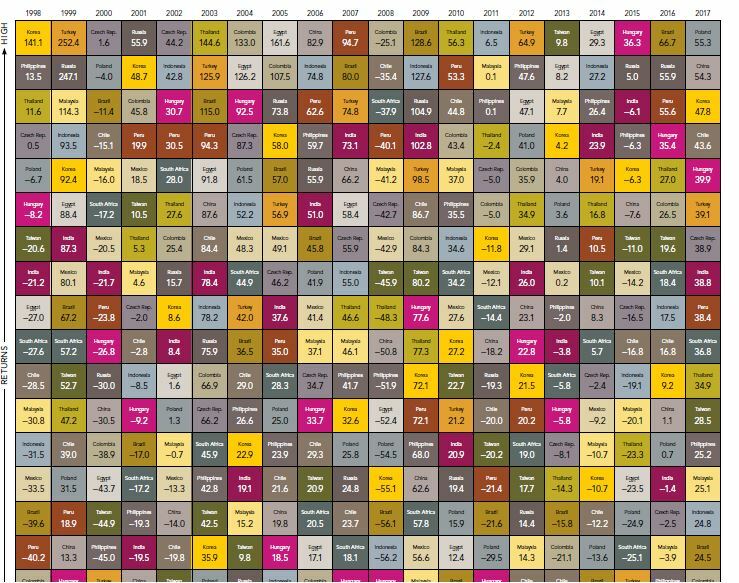 The 30-50 years I still have left in my investing career is a long time. I cannot see a rational argument that dismisses the possibility of the US losing its position as the dominant economy over a time span that long. To address your last sentence; diversification is not intended to maximize returns. A diversified portfolio is intended to protect against various forms of risk. One of those risks is that your home market declines while the world as a whole moves on. It does not, so what's your point? Loosing one's position as dominant economy does not mean that it is going to under perform rest of the world. Next FAANGs, BA, IBM, Tesla etc. may spring out from rest of the world but that does not mean US would stop innovating and would not move in pace with ROW. I too have 30-50 years ahead of me and in my foreseeable future I dont see that's happening. However you may want to hedge against unknown by compromising some returns, it is perfectly ok. I think that may be called insurance. Trading costs, expense ratios of mutual funds, loads, advisor AUM fees, hits from front-running by high speed traders. Last edited by Northern Flicker on Tue Dec 11, 2018 1:34 pm, edited 1 time in total. The arguments that assume that somehow the market is not aware of all of the above factors, and uses them to value US and international stocks, are basically an argument against efficient markets. And they are a particularly egregious form of that argument, because this is corn-ball analysis. One doesn't even need to read The Economist or Bloomberg to make these observations. So how then is an investor likely to make a more sophisticated judgement than the stock market as a whole? Is the market not only inefficient, but also pretty dumb? What they are saying is they cannot explain value stocks with beta. That's true of US domestic stocks, and international stocks (actually, *you* are international stocks - what we really mean is "non US" ). I am not sure how this weighs for or against non-US investing?